How does iOS reduce its dependence on web search from Google or Bing? 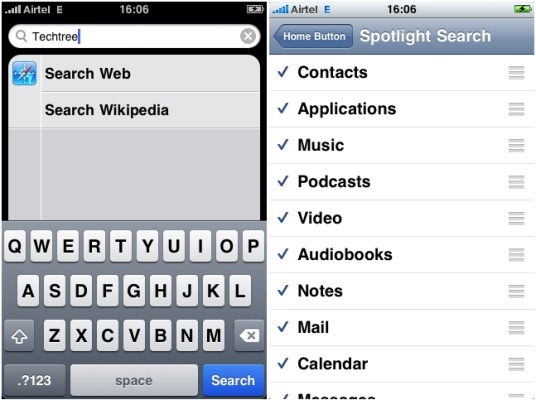 Simple, syndicate Spotlight searches to installed apps. Imagine if every iOS app could implement a ‘search’ capability, that would be exposed to the iOS search subsystem. This search could be over local data, e.g. Address Book-like applications; over remote data, e.g. Wikipedia; or over either, e.g. Mail. Your favorite content sources (like Yelp), content aggregators (like Flipboard or New York Times) and even crowdsourced information aggregators (like, hey, Twitter and Facebook) already reside as apps on your iOS device. Any search you’re interested in doing would hit these apps first – and would probably show the information you care for right at the top. If you’re connected to the Internet, and if it makes sense, the search will be syndicated to participating web end-points for the apps, that are pre-registered with iOS when the app is installed. When you search for ‘Sushi’, the Yelp web endpoint is queried and the results displayed. In fact, apps would provide associated credentials as part of this registration to the search subsystem – for instance, Facebook credentials would be required, in order for Spotlight to get personalized search results, from your Facebook friends, for a given search query. This isn’t only about finding ‘links’ to information, of course. Just like the current iOS spotlight understands the results as deep links into an app (e.g. the ‘Amit Kumar’ result leads to the right entry in the the Address Book app), results in this new search system would lead to results deeply embedded into the actual apps. So, a result for ‘Amit Kumar’ by Facebook would lead to my Facebook profile page, but the results for ‘Lexity‘ could lead to pages shared by my Facebook friends that match that query. We know Siri will be opened up to other services, not just Wolfram Alpha and Yelp, eventually. When it is, imagine how it could disrupt Google Search – by becoming your ‘search assistant’ – searching not the entire web, but only the parts of the web you care about, at the speed of sound. Not only will this be extremely convenient, it could disrupt what ‘search relevance’ means for the common man. I can’t wait! This entry was posted in Posts and tagged apple, ios, search, siri by amit. Bookmark the permalink. Ah, nicely written. I think of it as a search type information bus/network local to your iPhone. And if all these apps could talk to each other over the bus (in addition to being queried for search by Siri), the possibilities would be even more interesting!